Bunny Myth Buster – “They’ve got fur coats so they’re okay in the cold”. Rabbits’ coats obviously do give them some protection against the cold but to say that it makes them immune is like saying a snail can stop a bullet with its shell! In the wild, rabbits live in underground burrows where the temperature changes only slightly between summer and winter. By keeping them above ground we are subjecting them to extreme temperature changes that they’re not designed to cope with. In the wild they share body warmth with the rest of their social group so they’re toasty and snug. Rabbits kept alone will suffer the cold worst of all because they can’t share the lovely warm body of a companion. If you know of anybody who doesn’t bother to take steps to protect their rabbit from the cold because of the “it’s got a fur coat” myth, then please put them straight and direct them to our tips on keeping warm. You will almost certainly be saving the rabbit’s life. 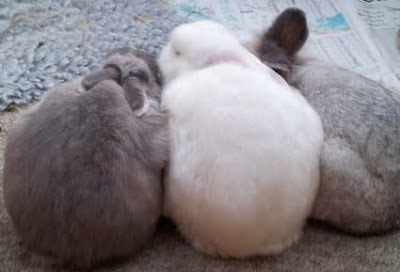 http://www.rabbitwelfare.co.uk/pdfs/RWAFtoptipsforwintercare.pdf That point about sharing body warmth is a great excuse to post a picture of three snuggle-buns!